Ubiqua Glass Frame | Home Studio, Inc.
Freestanding mediacentre in steel and glass. 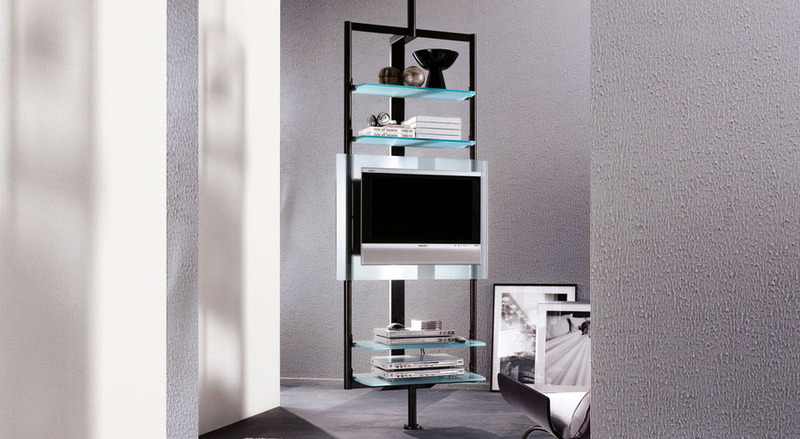 The TV-stand unit allows the wires to run from the floor through the bottom plate and through the central post ( mm. 24). The wires coming from the wall can be introduced into the unit through a hole foreseen between the central post and the wooden board. The back board can be removed pushing it up to allow the different electronic equipments wires to connect to the plugs inside the TV-stand unit. The rotation of the TV-stand is blocked at 30° on the right and at 30° on the left to prevent dangerous torsions of the wires. It is final customer responsibility to remove the lock unscrewing the screw located on the central post.